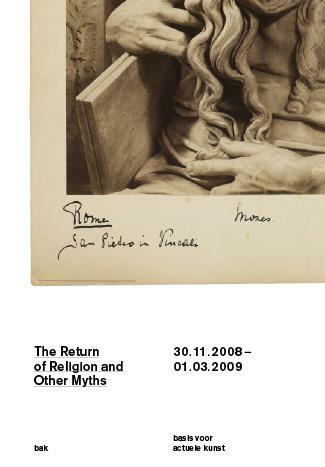 This handbook is part of The Return of Religion and Other Myths, a large-scale multifaceted project, consisting of the exhibition The Art of Iconoclasm curated by Sven Lütticken, a discourse program taking place in early 2009 titled On Post-Secularism, and the publication of a BAK Critical Reader on the subject in 2009. The project explores the popular assumption of the return of religion to the public sphere, contemporary politics, and the media in the West as a constitutive “myth.” The handbook contains texts by Maria Hlavajova and Sven Lütticken as well as images, descriptions of works, and biographies for participating artists Carl Andre, Carel Blotkamp, Guy Debord/Jean-Léon Gérôme, Rod Dickinson & Tom McCarthy, Hans Haacke, Arnoud Holleman, Imi Knoebel, Gert Jan Kocken, Krijn de Koning, Willem Oorebeek, Natascha Sadr Haghighian, Haim Steinbach, Rosemarie Trockel, and Lidwien van de Ven. Also included is an overview of the lectures that took place within the framework of On Post-Secularism.